Nursing Home Launches New Investigation After Woman In Vegetative State Gives Birth A former prosecutor of Maricopa County, Ariz., "will have unfettered access to every facet of [Hacienda Healthcare's] business — including all the records related to this matter," the company said. Rick Romley, former Maricopa County Attorney, held a news conference on Monday, explaining his role in the internal investigation of management and security practices at Arizona's Hacienda Healthcare. The owner of a long-term care facility in Arizona where a patient in a vegetative state was impregnated and gave birth last month has hired a former Maricopa County Attorney to lead an internal investigation into the "facts and circumstances" leading up to the sexual assault. On Sunday, Phoenix-based Hacienda Healthcare confirmed in a statement that it had recruited Rick Romley "to ensure a comprehensive, objective and transparent review of the facts of this deeply disturbing matter." "Mr. Romley will have unfettered access to every facet of Hacienda's business —including all the records related to this matter and all the operational procedures related to the [facility]," the board of directors said. "We will do everything we can to aid this review and, once it is complete, to make sure this unprecedented situation never, ever happens again," they added. At a news conference held Monday morning, Romley explained his investigation will differ from parallel ongoing inquiries by local law enforcement and state and federal agencies, as it will focus on uncovering lapses in management and security practices that allowed the sexual assault to occur. "I will be going in there and looking at the security surrounding the entire facility to make sure that there's no future harm to any of the other patients," Romley said. The investigation will look at how visitors are admitted, review the security guards on staff and examine the placement of surveillance cameras throughout the facility. Romley will be aided by a health care professional "with an expertise in this area," he said. "[Police] are trying to find the perpetrator of this horrendous crime; they are not going to look into the management practices, the security of the patients or for potential future harm," Romley added. The Phoenix Police Department served Hacienda Healthcare with a search warrant last week to collect DNA samples from all of its male employees. Additionally, as NPR reported, the Arizona Department of Economic Security launched a review of the health and safety of all patients at the facility following the birth of the child on Dec. 29. The agency, as well as the state's Department of Health Services, is collaborating with police. Romley said he was initially reluctant to take on the investigation but was persuaded by the board of directors after they unanimously provided "assurances that they want to correct this matter." "When you begin these internal reviews you find out things that maybe you did not know, and I was not going be the one that basically buried it," Romley said he cautioned the board before taking the job. The former county attorney has earned a reputation as a dogged investigator whose findings often lead to widespread reform. "Since leaving the County Attorney's Office in 2004, he has carved out a niche for tackling issues of public corruption, and his investigations have resulted in reforms and criminal convictions. He briefly resumed his role as interim Maricopa County Attorney in 2010," azcentral.com reported. Employees at Hacienda Healthcare said they had "no idea" the woman, who has not been identified, became pregnant under their care. The 29-year-old woman has been a patient at the facility since the age of 3 and according to authorities, has been in a vegetative state for more than a decade. On Friday, police released an audio recording of the 911 call made by a nurse, moments after the baby was born. "Baby's turning blue! Baby's turning blue!" a nurse screams at the start of the 5-minute and 11-second recording. It appears the child was not breathing and staff were frantically trying to resuscitate the infant. Officials have since reported the baby and mother are in stable condition. Throughout the portion of the released call, the nurse repeatedly says she and the staff were completely taken by surprise by the delivery. "We had no idea she was pregnant," she says over and over again. Hacienda Healthcare has come under scrutiny for suspected malfeasance in the past. In 2014, the nursing home was accused by the Department of Economic Security of fraud for allegedly overcharging the state by $3.4 million. "We made the decision to stop sending new clients to Hacienda in the latter part of 2016," former department head Timothy Jeffries told KPNX 12 News. But that decision was overturned after Jeffries was fired by Gov. Doug Ducey. The state subsequently sued the company, which maintains it had done nothing wrong. However, Hacienda officials refuse to turn over any financial documents requested in a continuing lawsuit. It was only after the discovery of the sexual assault became public, that the state severed ties with Hacienda, according to azcentral.com. 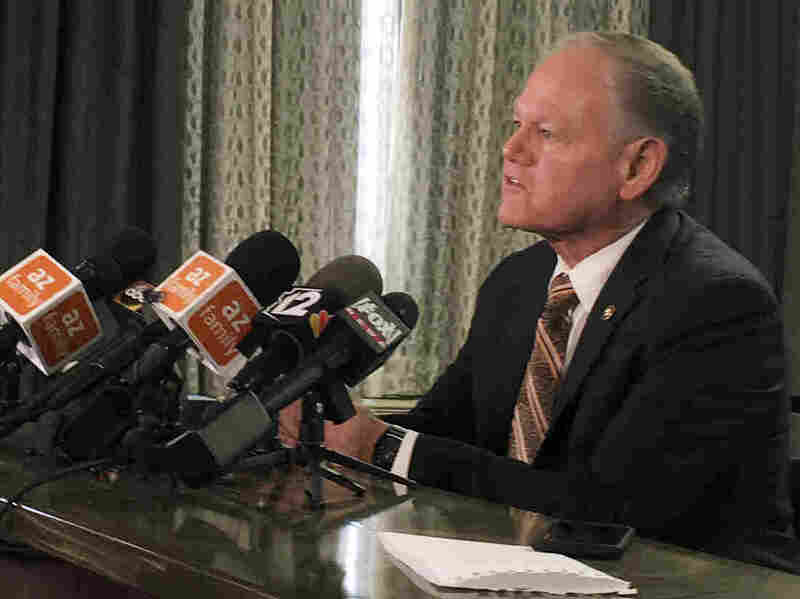 The news outlet reported that Ducey's office issued a statement on Friday, suggesting he is considering "alternate options such as bringing in a third party to assume responsibility for the ongoing management of Hacienda."